24,00 € Tax incl. 20,00 € Tax excl. PLASTIMPERM F10 gives the material treated preventive protection against moisture, water, some solvents and certain formulations of petroleum products such as white spirit, limonene, ethyl acetate and acetone. PLASTIMPERM F10 provides moisture resistance and water recovery for polyamides, PLA and moisture-sensitive materials. This specific formulation does not reduce the dissolution capacity of ABS by acetone and of HIPS by limonene. PLASTIMPERM F10 is also compatible with composite materials, ceramics and thermosetting matrices such as epoxy resins, polyurethanes and polyesters. After drying, the product is non-film-forming and will not alter the colour or appearance of the treated material. PLASTIMPERM F10 does not change the original appearance and mechanical properties of the treated material. Please note: After application, PLASTIMPERM F10 does not allow subsequent treatments such as painting, varnishing or adhesive treatment. PLASTIMPERM F10 is a ready-to-use solution. Shake or stir before use. Decanting is possible without affecting the effectiveness of the product within the use-by date on the label. Before treatment, make sure the part to be treated is clean, free from dust, grease or any residual chemical. PLASTIMPERM F10 can be applied with a low-pressure sprayer, brush, roller or by dipping. It’s applied in one or two coats of 100 to 300g/m2 of solution (depending on the porosity of the surface to be treated). 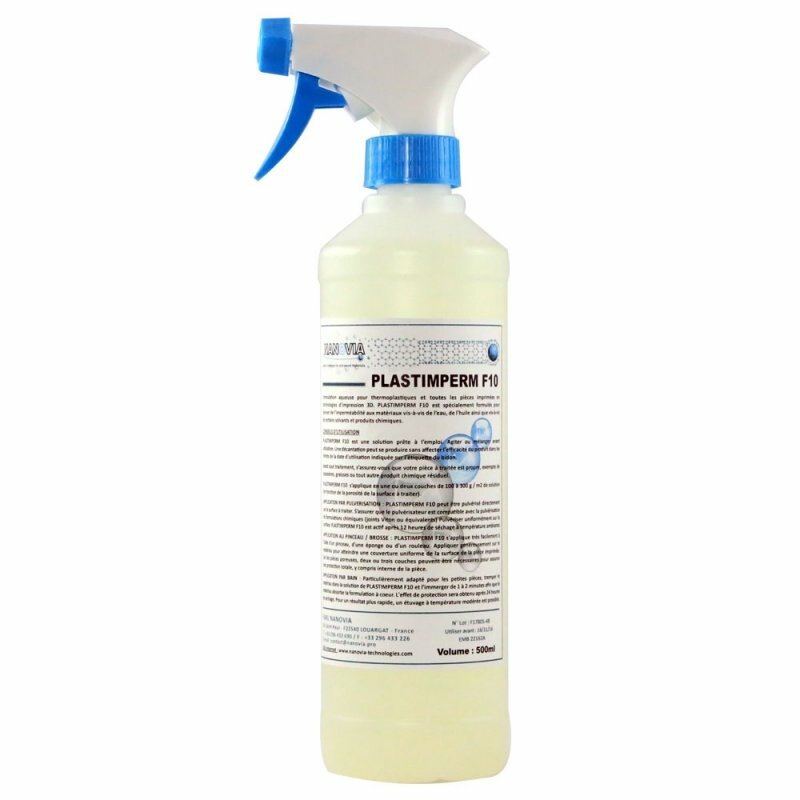 SPRAY APPLICATION: PLASTIMPERM F10 can be sprayed directly onto the surface to be treated. Ensure the sprayer is compatible with chemical formulation spraying (Viton seals or equivalent). Spray evenly on the surface and leave to dry for 12 hours at room temperature. APPLICATION BY BRUSH / PAINTBRUSH: PLASTIMPERM F10 is easy to apply with a brush, sponge or roller. Apply liberally to the material to produce a uniform surface coverage of the printed part. On porous items, two or three coats may be required to ensure complete protection, including inside the part. BATH APPLICATION: Particularly suitable for small parts. You should soak the material in PLASTIMPERM F10 solution and immerse for 1 to 2 minutes so that the material absorbs the formulation deep inside. The protective effect will be obtained after 24 hours of drying. For faster results, a moderate-temperature oven is an option.